Is Your Dental Business Killing You? Look Out For These Tragic Signs…. One of the real difficulties of being a business owner is the management of personnel. As dentists, or rolling back the clock, as dental students, we are really unequipped or poorly trained in the management of the people we employ to be helping us with our business. Now let me get this straight. This may be only an Australia thing. It may be only a Sydney thing. But it also could be a generational thing….it could also be a Gen X or Gen Y thing? I am not sure. Well that’s just not on. My philosophy on employment is simple. If I’m paying you, paying you money, then I expect you to do as I say. As long as what I say for you to do is not illegal, then heck, if I’m paying you, you do it. After all, I’m giving you money for doing it, so do it!! I own the business. I paid for it/am paying for it. I have taken the risk, you haven’t. So just do it! There are 168 hours in a week. For 38 hours, I pay you to do what I ask. From this you get money to do what you want with it for the other 130 hours. I don’t tell you what to do with the money and time in the 130 hours. What I do expect is that for the 38 hours, you give me support, and respect, so as I can pay you. Recently I visited an office where there certainly was a renegade employee. Sadly, one employee was bringing down the morale of the whole office. Repeated sick day leave, chronic dawdling, not completing daily tasks. The offending team member’s attitude reflected poorly on management and owners. Now, I know, I know from first hand experience, that running a dental office is not easy. For a start, unlike conventional businesses where management and owners can observe and peruse employees in action, the poor old dentist is often stuck being the producer of the business income and billings, drilling away down in a distant operatory, with no idea whatsoever what is going on at the same time with other employees in other parts of the office. And therein lies the problem. Often, a big problem. As a dentist, you are good at what you do. You love the dentistry, and the doing of dentistry. But the business of dentistry? Ugh!! You kind of know your business is not running as smooth as it can, but you let it keep going, on its own, because the pain of fixing it is something you just don’t want to have to deal with. Well this is sad. Very sad. And it is a common scenario out there in dental business. Sadly, running a dental office with even one recalcitrant staff member is like driving down the freeway at full throttle dragging two big timber tree logs chained to the back of your SUV. You know you’re going as fast as you can, and heck, you know those logs are hurting your progress, but, you’re still getting to your destination eventually. Just not with maximum efficiency. I’ve seen offices where toxic employees like this are costing the office $200,000.00 per year!! Now that’s a big piece of change!! Multiply that by five years, and there’s a million dollars, straight off the bottom line, going down the drain. I know the pain of action is huge. But the pain of inaction means less profit, and more work, and that’s killing you, doctor. The answer is simple. You need to hire an outside consultant. You need to hire an independent firm to come in and look at your office, and work out where your handbrakes and restrictions are, and what exactly they are costing you and your family in loss of revenue and theft of your time. While you go on doing the dentistry. The dentistry that you love to do. The consultant will play good cop bad cop with your team. And they’ll work out who’s on the bus in your office and who’s not. Now sure it costs. It costs to hire outside help. Because your patients will pick up on the situation. For sure. And that’s not good. Don’t think you need outside help? Listen to this tale. I recently heard of a dental office where the owner had a nervous breakdown. And was hospitalized. The front office lady at this office was described by one consultant, as the most toxic employee they had ever met in dentistry. She spoke badly to the staff, to the patients, as well as to the doctor, and to the doctor’s wife! And she didn’t mind doing it with an audience, be they other staff or even in front of patients. Sadly, for this office, a consultant had identified this employee as being toxic some six years prior, and recommended her removal. Very sadly, and now, tragically, in reflection, the doctor had kept her on, because the toxic employee had said that she was going to change her ways and come on board. The consultant from way back then was horrified at what had transpired. Absolutely horrified. In dental school, we’re taught the skills of dentistry. But we’re not taught the business of dentistry. And the business of dentistry is the business of business. You’re in business to make a profit. And to do what you want with that profit. You’re not in business to drive yourself into an early grave. Hire a consultant! And act on their advice. Get your office running smoothly. Your quality of life depends upon it. Three Secrets For Great Customer Service – Three Things You Can Implement Today in your Dental Office With Immediate Impact! I’m often asked what are some simple things that a Dentist or Dental Office can do immediately that will have an immediate impact on the experience that your valued patients and customers will have when they visit your Dental Office? Well, here are three simple to implement ideas that will have your clients, customers and patients raving about you. Make contact with your customers. One of the best ways to differentiate yourself and your dental office as being different to every other dentist in your suburb, or even in your City, is for the Dentist to make verbal contact with the new patients prior to their first visit. Yes, that’s right. Phone them. Doctors should phone the new patient within twenty-four hours of the patient making a new patient appointment. It’s so easy to do! And so powerful! And that’s because, no other dentist around is doing this! Doctors, make this one just a quick courtesy call. “Hi Mrs. Smith. It’s Dr David Moffet here from Active Dental. I see you’ve made an appointment to see me next week? Well, I just thought I’d give you a quick call and introduce myself to you on the phone, so that we kind of ‘know each other’ then prior to your appointment. So I’m ringing to say ‘Hello’ now to you, and say, I’m looking forward to meeting you in person on Friday at 200pm. Stay in touch following the dental appointment. But being asked *after* the event. Being called by the restaurant the following day is far more powerful and impressive than being asked how your meal was by the server clearing your plates away. Imagine your patients’ delight when they receive a call from your office, the lady who assisted the doctor during your procedure, or even, from the Doctor himself, just checking that they are feeling OK after their procedure and to ask them if they have any questions at all? And to let them know how much we are looking forward to seeing them at their next visit? Say thank you for small mercies…personally. Some of your patients will go out of their way to “connect” with you as a person. In a thankless environment, and let’s face it, Dentistry really is the Ultimate *Grudge-Buy* these days, [even more than buying tyres! ], in that very thankless environment we need to give praise and thanks openly to those patients and clients who reach out to us on a personal level. Thank them. Yes, go out of your way to thank them. There’ll be those who send and bring gifts. Things they’ve made. Paintings. Drawings. Cakes they’ve baked. There’ll be those that send things. Press clippings. Magazines. Things that are topics of interest to you. Nothing will warm the hearts of those patients more than receiving thanks and heartfelt thanks personally, from you, as praise for an unexpected, thoughtful kind gesture. So when you receive the attention, pick up the phone. Offer your personal thanks. It really is easy to be a different dentist. Giving thanks, openly, goes a long way towards showing that difference. Because no other dental office out there is doing the little things. Keeping in touch is just one of the many straight forward and easy to implement modules that make up The Ultimate Patient Experience, a simple to build system in itself that I developed that allowed me to create an extraordinary dental office in an ordinary Sydney suburb. If you’d like to know more, ask me about my free special report. Most Dentists Are Just Wasting Money Hand Over Fist. Dumb! I read an article recently http://bit.ly/13NXYVe about the common lies dentists tell themselves. One of the lies that really struck a chord with me was that leadership training does not apply to dentists and dental offices because “we are all professionals and know what we’re doing”. Gosh, I know this sort of attitude exists a lot in dental practice. For some strange reason dentists believe that the principles of business do not apply to the running of a dental office. Well let me tell you that is wrong, wrong, wrong. Any dentist *NOT* running his office as a business using sound business practices and principles is burning up greenbacks hand over fist, for no sensible reason whatsoever. It’s like golf. Golf has basic fundamentals to hit the ball well. Grip and stance. Get these right and you’re half way there. Recently I played with a nice chap who gripped the club like there was no tomorrow. Like an axe. As a golfer he made a great woodchopper. Golf for this chap was hard. The ball mostly travelled left to way right, sometimes right only, and sometimes left and even way left. It was predictably bad, and sometimes very unpredictably real bad. Seriously, the only thing to do was close my eyes so as not to learn any bad habits. The chap, for whatever reason, had chosen to ignore the basics. The term “golf swing” was very loosely applied to what he did. Similarly, too, when I hear dentists espouse that leadership training does not apply to them, then I know that they are choking their own future, strangling their own success, in just the same way that this chap was choking his golf club!! All the top golf pros have coaches. Swing coaches. Some have mental coaches. Sir Nick Faldo and Tiger Woods have both successfully rebuilt their golf swings to the betterment of their careers at the time. At the time. If you want to maximize your dental office potential and returns, then you need outside help. It’s that simple. Maybe your office likes burning up dollars. Running inefficiently? Not having good systems? Not looking at numbers? Not analyzing? Maybe you’re happy not having huddles? Not having team meetings on a weekly basis? Are you sharing your wins [and losses] with your team? Are you letting them know, giving them feedback, as to what is working for the office and what areas seem to be letting the office down? Everybody needs outside help. Every office needs advice. There is a lot of good information out there that can help your dental business run more efficiently, and as a result, run more profitably. I heard the story on the weekend of a dentist who couldn’t sell his office and so kept working well into his eighties. I was sick to the bone. This can’t have been a wonderful life? Not for him, and certainly not for those patients of the late years of his practice. In 1996, I thought my dental office was doing all right. We were collecting twice what the average dental office was collecting. That was until I met a dentist collecting two and a half times what I was. That’s right, a dentist whose office was collecting five times the average. I knew then and there, that there had to be a better way. And I knew I needed to find out who could help me, who could teach me that way. I was fortunate, in the ensuing years, to find the right mentors and coaches that I needed, who helped to mold and train me, with the skills I required, in leadership and management, to create a dental office that was also a very, very profitable business. 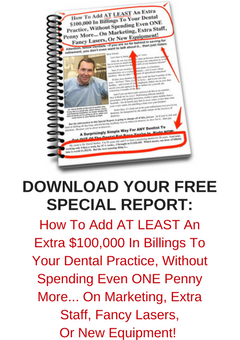 The benefits of having a dental office running as a profitable business are many. Primarily, though, is the reduction in stress, the burden of worry about paying the bills is lifted. We can talk more about this in the future. So I say to you, step down from your pedestal, take a step back, and ask yourself. Will my life be better, will life be better for my customers and my team, if I do things better? You know the answer. Seek help. It’s in everybody’s best interests. I read an article today http://bit.ly/14mB6u5 discussing the current state of restaurant wait staff. The article bemoaned that so many wait staff in Australian restaurants consider restaurant service as not a real job. Although basic wage conditions and tipping practices are different in Australia to those in the USA, there are some interesting universal principles of performance that can be drawn from this article. The article highlighted the story of a young waitress, Sonia Bandera, who at twenty seven years of age, had fought off a strong list of competitors from some of the best restaurants in Australia to win the title of ‘Best Young Waiter 2013’. The article pointed out, quite rightly, that it takes a lot of hard work and dedication to the hospitality industry to reach the levels of skill required to be considered for such a prestigious award. The article talks about how Sonia revealed several key points of note during a recent radio interview with Kelli Brett on ABC radio. Sonia revealed three very key points which I believe are applicable to all jobs and professions. Firstly, she loves going to work each day, and is very serious about her career path and chosen profession. She is not doing wait work while she waits for another job to come up. This is her career! Secondly, Sonia speaks highly of her boss, head chef Neil Perry and his passion for his work. She also loves being a part of, and being able to contribute to the restaurant *experience* of the many diners she gets to serve. Thirdly, Sonia likens her role in service at the restaurant to being similar to that of a professional therapist, in that she needs to be able to recognise customers’ moods, tones of voice, and the body language they use. Recently, one of my dental office clients was hiring and interviewing for a Front Office Position. Their policy, as suggested by me at The Ultimate Patient Experience, is that the Front Office Receptionist is the Face of the Dental Practice. Similarly, in interviewing for this highly specialized and important role, there have been applicants with Dental Assisting experience who feel “it’s time” for them to move to the front desk because they’ve worn out their interest in the clinical situation. As a Career Dental Person, all dental employees can learn considerably and advance their careers in leaps and bounds by following the three key principles expressed above by Sonia Bandera. Love your work! Do it with passion! If it’s not motivating you, then you are not giving one hundred percent to your employer and your valuable clients, customers and patients! Speak highly of your boss, and respect their work ethic and passion. Your boss is on board. You need to be on board with your boss, and show it! Love your clients and customers. Take an interest in them as people, and remember, they are all different; they are all individuals. Also remember, it’s the customer who pays your wages, not your employer. An employee who loves their work, loves their customers and outwardly expresses their respect for their employer is a valuable asset essential in providing a World Class Customer Experience. Essential in providing an Ultimate Patient Experience. Correct hiring is just one of the many straight forward and easy to implement modules that make up The Ultimate Patient Experience, a simple to build system in itself that I developed that allowed me to create an extraordinary dental office in an ordinary Sydney suburb. If you’d like to know more, ask me about my free special report. The Big Mistake of Failing to Diagnose, Present, and Schedule Complete Dentistry – Is Your Team Really On Board? I was chatting with a fellow coaching colleague the other day about the performances of dentists and dental office clients, in general. In discussing the gross fees per day that various doctors were producing and collecting, it was interesting to discuss the range of figures out there and we postulated as to why indeed there was a range at all. There are various reasons why some dentists are producing, or collecting low daily amounts, while others are seemingly producing and collecting easily, sometimes three, five and ten times per day the amounts of their colleagues. *Seeing* the dental work is important. I know. I’ve employed assistant dentists in the past who for the life of me just haven’t seen the work needing to be completed in the mouths in front of them. When I’ve taken over the care of these patients, I’ve been amazed at the undiagnosed and unpresented treatment just sitting in the patient’s mouth just waiting to be done. Sometimes the dentists see the work, but pre-judge that the patient may not be able to “afford” all that they see, so the dentist chooses to “select” the dental work he presents to the patient. I recently spent time on the phone with another coaching colleague who works specifically with hygienists training them to see, recognise, and bring to the attention of the doctor, necessary treatment that needs to be presented. The difference in the practices that this consultant deals with is staggering! Where hygienists are encouraged to see, and mention what they see to the patients and to the dentists, the practices are scheduling restorative treatment on averages of in excess of $10,000.00 per day. In contrast, in Dental Offices where the hygienist performs only as a tooth cleaner, and the dentist enters and is required to perform all the examination only, and usually in limited time, in these offices the treatment being scheduled out of the hygiene room is considerably less. There are many reasons for this disparity. Primarily, the way I see it is this. The hygienist spends a lot of time with the patient. While performing the hygiene cleaning, they have plenty of time to see and observe any defects they find, and record these findings. They certainly have time and are in a position to be discussing with the patients what treatment options may be available. When the doctor comes in to provide the examination, it is very helpful for him if he is confirming the observations of the hygienist, as opposed to suddenly having to discover, discuss and explain all things himself. You see, the patient builds trust with the hygienist, immediately, purely as a reflection of time spent. While the patient is having their teeth cleaned, they are placing the hygienist in that position of trust. They know that the hygienist has their best interests at heart, and they *feel* the hygienists care through the hygienist’s performance of the cleaning. That trust in the hygienist’s actions and deeds transfers to the hygienists observations and sightings and explanations. A good hygienist and a good dentist know how to “sell” the dental treatment they see, and I use the word “sell” in its literal meaning. Let’s face it. Dental disease is not static. It’s not like closing the door on an untidy bedroom. It’s there, growing and spreading. Growing, and spreading, all the time. Dental disease, disease of the gums and the teeth, gets worse with time. Period! A cavity seen today and drilled and filled today will be smaller than if left for a year. Decay advances. Periodontal disease advances. So it is logical to treat early, to conserve tooth structure. Watching cracks in teeth is wrong. Cracks spread, teeth break and then we have lose more tooth structure. Valuable tooth structure that we could well have utilized. I’ve seen dentists write “watch” on dental charts. I’ve seen more dental charts with more watches than a TAG store! Really! All these doctors are doing are “watching” necessary treatment walk out their door. Dentists need to have team members and systems and procedures in place to ensure that all necessary dental conditions are seen, presented, discussed, sold and scheduled. For the patients’ benefit as well as for the dental office. It just doesn’t make any sense to be not diagnosing and treating all the dentistry that we see. Dental offices that are identifying, scheduling and completing all necessary dental treatment seen are performing their honourable duty to their patients. And guess what? The dental office stays busy and productive! This means, a profitable business, with happy, less stressed doctors, happy staff and team in secure employment. Happy team and happy dentist means happy patients, too! There’s no question about the benefits to all. Patient, practice and team. If your team and your systems are not helping to diagnose and schedule all treatment, then it’s time to change your systems, and your offending team members. Failure to diagnose, properly present, and schedule and complete all the dentistry that we see, is a crime. Leaving undone work out there doesn’t do anyone any favours. The dentistry needs to be presented, and completed. For the betterment of your patients, your practice, and your team, and yourself, doctors!! Everybody’s health depends upon it! !